Gimsoy church at 1 am during midnight sun. 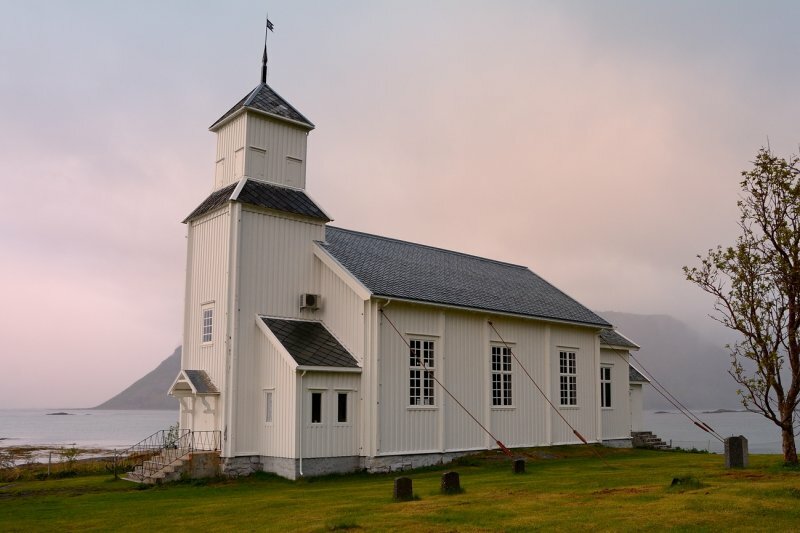 Gimsøy church is a parish church in the municipality of Vågan in Nordland county, Norway. It is located in the village of Gimsøy on the island of Gimsøya. A wonderful capture of this beautiful white wood church.V!! Magic lights and mood. BV. Excellent capture. Great light and surroundings. That's a first for me, I've never seen a church that needed to be secured by steel cables. It is so nicely photographed. A fine subject captured beautifully! A wonderful image of this great looking church. Interesting that they have to secure it with cables. Great midnight shot of this beautiful country church Ton. An attractive church building. V.
Those cables tella story about wind don't they. "V"
Wonderful ambiance with this lighting. Really like your composition too. The cables give an idea of what it's like when it isn't so serene. "V"
I really like the location of this church. I wondered what those cables were for.. They must get strong winds.. Interesting history and an excellent capture of this old church. V.
The soft light and colors are beautiful and match very well with the ivory tone of the church. Interesting information too ! V.